Note: Make sure you define your function before including the response, otherwise an undefined function will be called and you won’t get any data. When the logged in victim visits our malicious page, we grab his data. For the sake of brevity, we display the data in the current page, neatly formatted. We simply create the Fetch method for the TransactionData object which is already part of the System object. The result is the same, so no screenshots from now on. We can basically use the same exploit code, just don’t forget to add the callback parameter when including the response with script tags. In this scenario, the callback function name is appended with something, usually a number. In most cases, we get something like jQuery and a short number appended to it, like 12345, the callback becoming jQuery12345. Logically, the exploit code remains the same, we just have to add 12345 only to our callback function name, and not when including the script. On my machine, it took around 5 seconds to display the alert with the callback name being jQuery12345. This means it took Chrome under 5 seconds to create over 10.000 functions, so I would boldly say it’s a pretty doable exploitation. The last scenario involves an API call that apparently does not have a callback, so no visible JSONP. This might happen when the developers leave “hidden” backwards compatibility with other software or the code simply was not removed at refactoring. So, when seeing an API call without callback, especially if the JSON formatted data is already between parentheses, manually add the callback to the request. While these are the most common callback names, feel free to guess some more. If our callback is added to the response, bingo, let’s ethically grab some data. Since we only displayed the data until now, let’s see how we can send it back to us. This is a minimal example of JSONP data grabbing you can use as a proof of concept. We make a GET request to our data grabber with the application response (transactions) in the data parameter. Note: make sure you use JSON.stringify() on the data since it is an object, and we don’t want to end up with only [object Object] in our file. Note: if the response is large, make sure you switch to POST since you may not receive the complete data due to HTTP GET size restrictions. 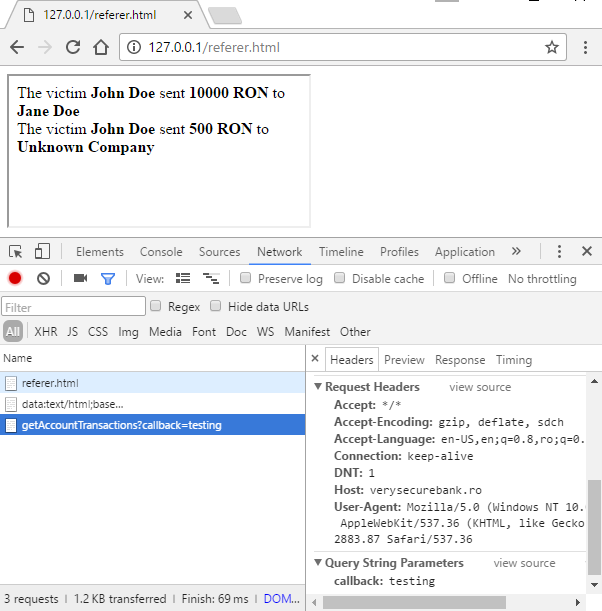 While hunting web applications for JSONP vulnerabilities, we might encounter some issues. Here we try to tackle them. In this example, Content-Type is set to application/json and X-Content-Type-Options to nosniff. Latest versions of Google Chrome, Microsoft Edge and Internet Explorer 11 successfully blocked the script execution. However, Firefox 50.1.0 (currently the latest version) didn’t. Note: If the X-Content-Type-Options: nosniff header is not set, it will work on all aforementioned browsers. 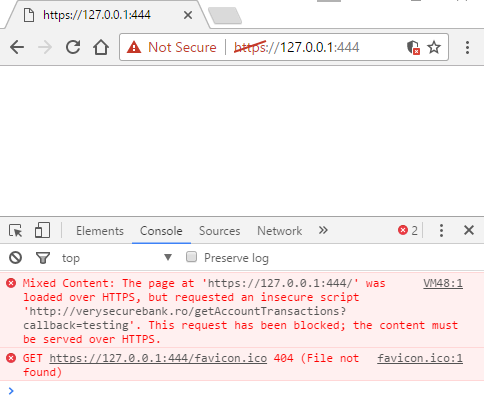 So even if we don’t get a 200 HTTP code, the vulnerability is still exploitable in other browsers. If there is a HTTP Referer check, we can try not to send it in order to bypass the verification. How can we do that? Introducing Data URI. We can abuse data URI scheme in order to make the request without a HTTP Referer. Since we are dealing with code, which includes quotes, double quotes and other syntax breaking characters, we are going to base64 encode our payload (callback definition and script inclusion). We can see that no HTTP Referer was sent in the API request. We can also avoid sending a HTTP Referer by hosting our code on a HTTPS page, if our target website can be accessed via HTTP. 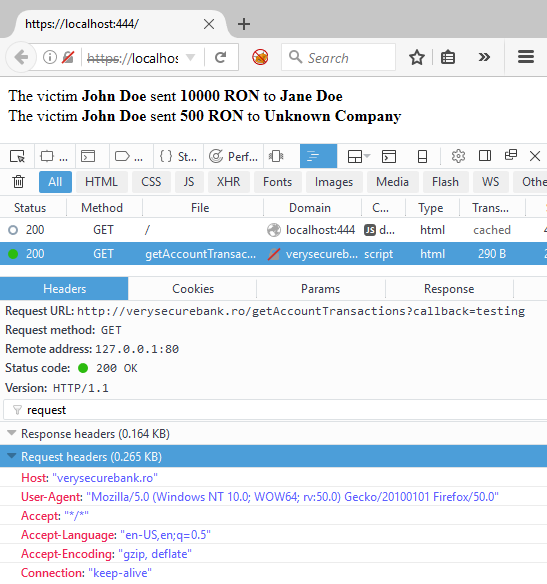 If we issue a HTTP request from a HTTPS page, the browser is instructed not to send the Referer header in order to prevent information leakage. 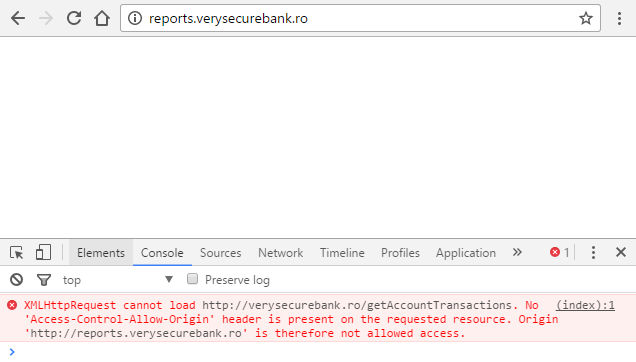 All we have to do is to host our malicious code on a HTTPS enabled website. Note: due to mixed-content security mechanism, this does not work on modern web browsers with the default settings. The victim has manually accept the security warnings of the browsers. Lastly, let’s see how we can prevent this from happening. The most straightforward and modern approach is CORS (Cross-Origin Resource Sharing). Although JSONP usage is decreasing, there is still a large number of websites that still use or support it. As a final tip, when dealing with JSONP also don’t forget to check for Reflected File Download and Reflected Cross-Site Scripting vulnerabilities.